A rock, is a rock, is a rock – you may think….but if you happen to take a stroll along the seawall in Vancouver B.C., and if it happens to be low tide, then you may happen upon something quite special. 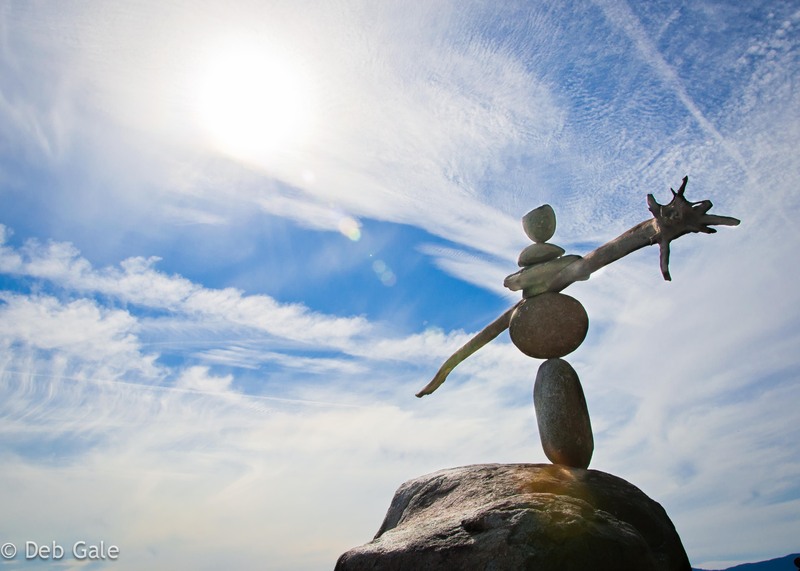 Rocks of all shapes, sizes and textures – carefully selected and which in their own right possess no particularly special qualities, but when precariously balanced together bring the landscape to life. 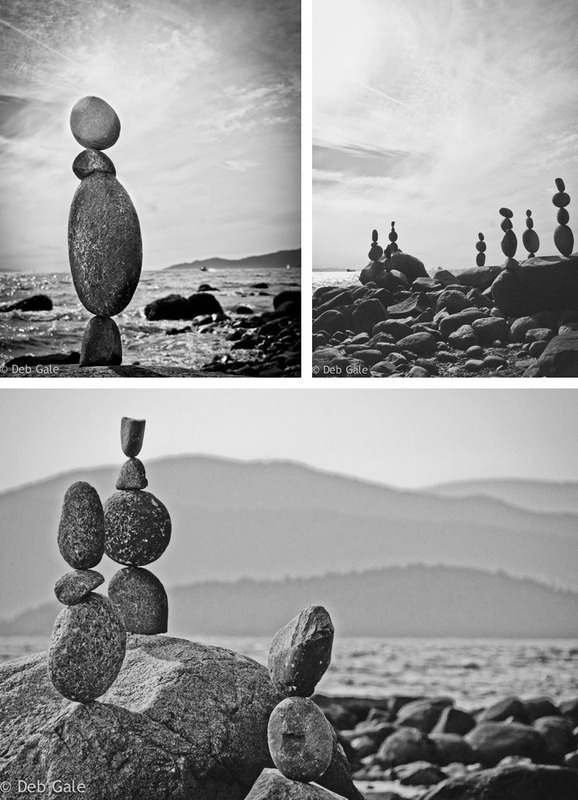 Prior to taking an interest in photography I periodically passed by these ever-changing art displays and on one or two occasions was lucky enough to spy the talented artist, whom I believe is generally known as Terry Robinson, but who I like to refer to simply as ‘the rock stacker’. As with any work of art, the way it’s interpreted and appreciated will vary with the onlooker…. for me, the set I captured below has a variety of characters and themes including ‘expectant mother’ and ‘the high-wire walker’, you will no doubt have your own opinion and that’s cool. Something that also resonates is how fleeting a spectacle they are….standing tall and proud one moment, then swept away with the next high tide to resume their place on the ocean floor. Yet another motivator to ensure I carry my camera and carpe diem. your images are truly spectacular. i have one gripe, though: a friend’s dog was badly hurt when he snooped around one of these creative sculptures in the south of spain. 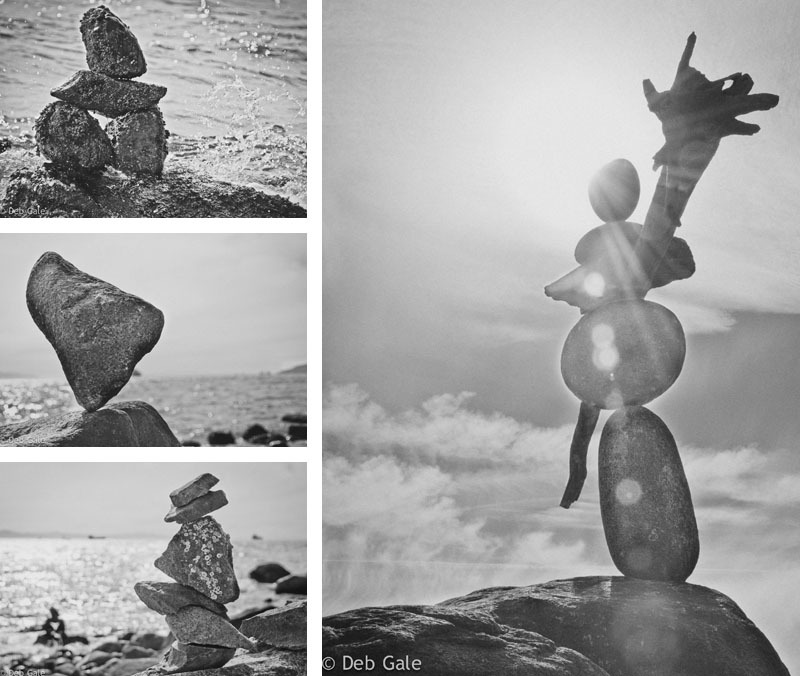 if anyone must stack stones, let them by all means do so, then take a picture, then please, please knock them down. you don’t want this tumbling on some kids’ heads. Hi there alessandro…very sorry to hear about your friend’s dog, I can only imagine how much one of those rocks would hurt. Fortunately the displays in Vancouver are below the tide line in a difficult to access spot. I had to climb down and scramble over some slippery rocks (probably not a very smart thing to do!) in order to get those shots. Dogs aren’t permitted anywhere on the beach off leash and I don’t believe parents would allow their kids to go down. So in this case, for the few days they remain intact at low tide, I don’t think they could do any damage. You do raise a very good point though and I appreciate it. By the way, I took a look at your gallery and I think your work is awesome. that makes me feel infinitely better. about the scrambling over slippery rocks… sometimes a good photograph is well worth running a few risks.